Last year, when political election and Black Lives Matter signs were uprooted, defaced or otherwise damaged, many Westporters were outraged. A few, though, said: Not so fast. Maybe they were blown over. Maybe the spray paint was just vandalism. Maybe it was kids making mischief. Hate does have a home in Westport. This entry was posted in Politics, Westport life and tagged "Hate Has No Home Here". Bookmark the permalink. Dan are you serious with this? Are you trying to start trouble? Are you bored on this beautiful Sunday evening? Do you know for certain this wasn’t the work of a few idiot high school or college kids looking for entertainment? What’s the point of your post? So “idiot high school or college kids” would make this okay? John. So where do you live now? What town? If this was an act of kids, it does not mean we have ‘hate’ in westport. Before we jump to any conclusion, especially by a guy who Moved away, let’s see if more of this happens. So many placed these signs on their lawns as we did and if anyone has an extra please let me know. Ours was destroyed by the snow plow. Different than John, I can post it on my lawn in Westport. Hi Bart, I live in Branford now. Does that make me inelegible to participate on this forum? John. Hopefully you are now paying property taxes. Might give you a real perspective. Since you lived on the premises of a private school, never paying property taxes, you probably never got a real sense of the neighbors and their respect and love in Westport. Instead you were very partisan. Just look at your social media posts. No, I don’t think you should participate. Bart, I’ve paid property taxes for many years in CT, and your suggestion that I “never had a real sense of the neighbors” is offensive. I was elected by Westporters to represent them on the Board of Finance, and i worked very hard for over three budget cycles to keep taxes low. If you doubt my effectiveness, or my dedication to the town, I suggest you review the video of my last meeting when First Selectman Marpe thanked me for my service, or ask my Republican colleagues with whom I served. I lived fifteen years in Westport, and in addition to elective office and grassroots politics I also served on the boards of the Historical Society, Earthplace, and the Pequot Library, brought Westport’s point of view to the CT Commuter Rail Council, and was an active member of the Westport Rotary and the League of Women Voters. I’m proud of my service to the town, and I’ve earned the right to have my say. John. Hopefully you will now pay property taxes. It is a lot different when you can feel the impaCT of decisions being made at the town level and state level. were offensive.. and childish. An apology would be in order. I don’t know either of you, but your overt attack on a fellow West porter, whether presently living here or not, is uncalled for. What does paying property taxes directly have to do with anything? If you rent then you pay property taxes indirectly. You still have a vested interest in the community. So you’re good with the anti Semitic chants of Fairfield Prep kids at Staples lacrosse games? Warner. Not sure who you are addressing the question to? Why don’t you repost and specifically ask, just in a case you are asking me. I am quite interested in knowing whether you are asking me. This thread is now closed to people who have already commented. If you’d like to continue this dialogue, please do so offline. I don’t think Westport Democrats hate Trump supporters. Why would you think this? Dial it down, Frank. I don’t hate Trump supporters. As the signs attest, hate has no home here. I would like to have a conversation with you or any other person who professes allegiance to Trump in an effort to discuss our differences and find common, and mutually higher, ground. Dan has my contact information. Frank. As a Republican I can say your response did nothing to help you out with support. Someone reached out to you and your answer was something about Maxine Waters. Who cares. It showed your own issues. Frank. Never be afraid in the USA and never be afraid in Westport. There are some that will never be friendly towards a republican even if Hilary decides to change parties. It’s a process they use to attack. I have been on the receiving side also. But Westport is a fabulous place and it is made up of more and more unaffiliated voters. You would be surprised by the numbers. Accept a hand that wants to listen. Dialogue is always better. Just don’t believe your eyes? This thread is now closed to people who have already commented. If you’d like to pursue this dialogue, please do so offline. Thank you. Thank you for speaking the truth, Frank. What you are saying is happening in real time, whether others want to admit it or not. It is blatant. It is pervasive. Maybe there is hate toward Trump supporters, I don’t know what is in someone else’s heart. But there is surely shaming and bullying and name calling. That is not to say that Westport is not a beautiful town to live in. It is. But there has been a shadow cast by divisive politics… and that is shameful. You are correct, the attitude can seem parallel to communism, as the socialist point of view that is becoming so volitile is just a step away. I have a dear friend who is from Estonia and she has drawn the same parallel as yourself . I know you cannot comment further on this thread…and rightly so, I think it’s a good idea that Dan limits “hot” conversation. But you can find me on FB if you wouid care to continue this conversation. Scott… you don’t begin an offer to discuss differences with…”Dial it down, Frank”. I know many many democrats…I don’t know of a single one that shows a hateful heart for trump or his supporters…..not one….. Confusion..surprise..disappointment…yes…..hate…….no. Look no further in either direction. Why does this forum persist in divisive politics? Isn’t there social media enough for that? Hi Dan – I’ll share that this week I watched as a bike rider stopped at my neighbor’s house and cleared the vines off their Hate Has No Home Here sign. It had become covered up in the woods by their house and was no longer visible until the passerby stepped in. At least there is sign work being done on both sides – destruction and recovery! The signs convey a beautiful message I hope the homeowner proudly displays them again. Deliberate destruction of private property is a criminal offense regardless of who does it. I remember running for office 12 years ago, and finding my signs thrown into the woods. Someone witnessed the person doing this and took down his license plate number. When the police interviewed him, it turned out that he just doesn’t like any signs and took it upon himself to get rid of them. 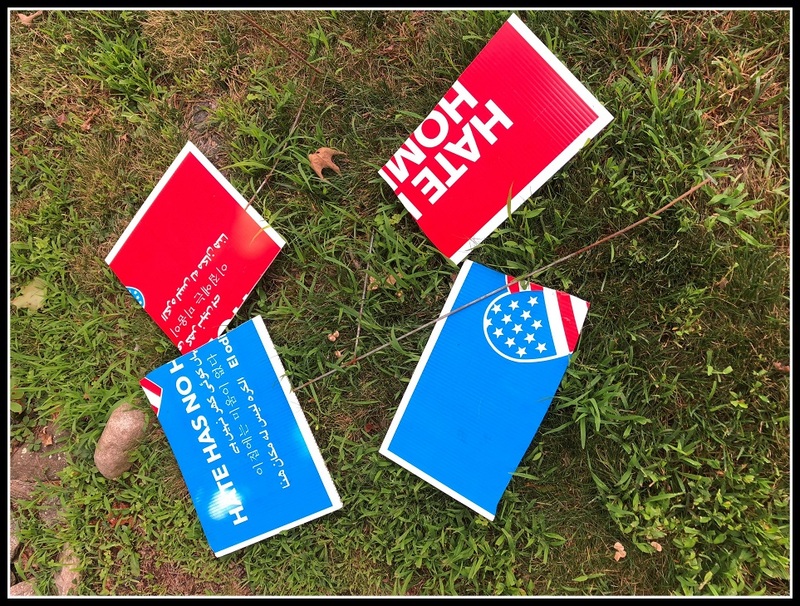 During another election, high school kids affiliated with a young political party destroyed our signs and actually posted photos on social media. They learned a lesson and apologized. These incidents are hopefully on the fringe and not mainstream in Westport. This thread is now closed to people who have already commented. Please comment ONLY if you have not commented already. Thank you. So there are sign haters living in, passing through or residing nearby Westport. And people living outside Westport have shown the temerity to comment- shame! But- Obviously from the picture someone with surgical skills somewhere hates our Westport anti hate signs – disproving what the sign says- There is room for a little hate, a little vandalism and/or a little small minded stupidity right here in Westport. The sign must be either wishful thinking on the part of the foolish person who posted the sign or a ploy to prove there are still haters among us- just to make us all look bad. Thankfully it had nothing to do with racism, anti religionism of any denomination( Catholic, Muslim, Jewish, Hindu, Sikh, Pagan), xenophobia, oenophobia etc- just plain old anti signism. Glad I am not a sign! Dan- thanks for the post- I am now on the lookout for those sneaky sign posters. They are easier to spot than the sign haters. And if you don’t live in Westport refrain from commenting on my post!! On second thought- if you live in Westport you could also refrain from commenting on my post. Respect & Fairness starts at home..as a member of the Board of Finance I am thankful for John Hartwell’s effort on the Board in helping keep our mill rate flat this year. Good work and good luck, John in your future endeavors. I think the title of this post describes Bart to a tee….way to derail a conversation about a local sign being defaced by attacking a former town representative. Hope you are proud of your behavior. The voters have proven the definition of insanity for far too long. Massive change is needed and may even be too late. Political hatred has enabled, off and on, ineffectual feel-good incompetence for decades. Wealth is fleeing the state and those who stay will pay. A visual representation of what giving an opinion on social media is like today. Slings, arrows and hate, with a side of intolerance (bigotry). Hi Bart- you are neglecting to say that Rowland and Rell helped keep this snowball rolling and growing that has landed in Malloy’s lap. Are you suggesting breaking contracts with the teachers and state workers on their retirement funds as a solution? Is that is your bottom line- clawing back funds from the folks we contracted with to provide teaching and municipal and state services for the past 20 or 30 years? Steve, I have asked people who have commented on this thread not to continue commenting. So it’s unfair to ask that question – he can’t respond. But I do know that Bart has always been an advocate for Westport’s schools. Someone in Westport also destroyed TWO Black lives matter signs in front of the Unitarian church.